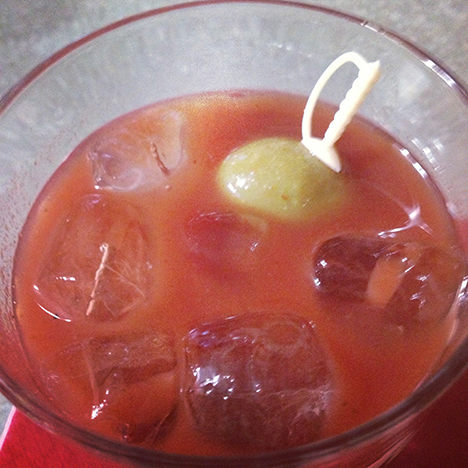 One of the best morning cocktails [besides the mimosa] is the bloody mary. There are dozens of popular variations on this tomato-based libation. I’ve had wonderful homemade bloody marys with friends, fancier custom made at an upscale bar and much needed early morning wake up calls with the standard fare you get while gambling at a casino. On New Year’s morning, I decided that given the impromptu decision to make my wife and I a couple of these vodka-laced drinks, that it was going to be simple. A bottled mix, vodka and a few spanish queen olives would be all I needed. Take a 1 1/2 oz jigger full of vodka – I like to use Tito’s Handmade Vodka – pour into a 12 oz glass with ice, squeeze a lime wedge then fill with bloody mary mix. Add ground pepper and a couple shots of Tabasco for that extra kick, but as my wife said, the mix is plenty spicy. I made both of our second drinks a bit stronger in the vodka arena [free pour all the way!]. When you want a bloody mary and you don’t need it to be perfect but you want it now, this is the perfect recipe for quick alcoholic satisfaction. Personally, I like a spicy cocktail so I prefer Mr & Mrs T Bold & Spicy Bloody Mary Mix then add a healthy dose of horseradish and tabasco along with the worcestershire. I pair that with either Onyx Moonshine (a Bloody Shine) or Black Lab Vodka, and opt for a dill pickle spear and olives. I take liberties here as my better half and the other half of MartiniHunter, Dave, always makes my Bloodys even though he doesn’t drink them. LOL! Welcome to the blog. 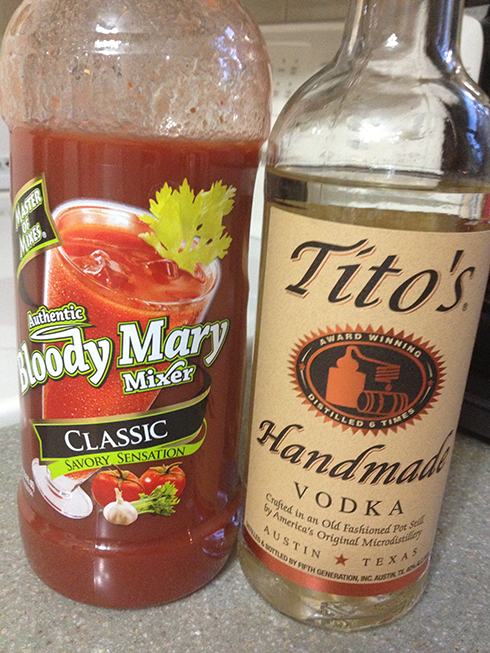 I normally prefer a spicy bloody mary, but my wife likes them toned down a bit. The adding of horseradish is a good option. I’ve not heard of Black Lab Vodka, but will have to look for it next time I’m stocking up the liquor cabinet.